TICCIH Colleagues in the European Union . . . In order to comply with the European Union’s new General Data Protection Law, WE NEED YOUR PERMISSION TO STAY IN TOUCH – even if you’re a long-term supporter or you’ve given us permission before. Please include “GDPR Opt-In” in the subject line. At any time you can change your mind whether to receive information from TICCIH. 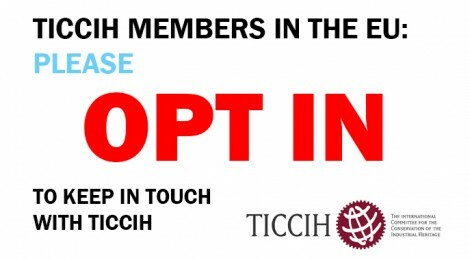 The International Committee for the Conservation of Industrial Heritage (TICCIH) holds the information you have given us on your membership application form in order to process and maintain your membership and to promote communication and collaboration among members of the TICCIH throughout the world. If you have any further questions relating to your information, TICCIH and/or the GDPR, please do not hesitate to contact us at ticcih@mtu.edu. Thank you for supporting TICCIH and for your interest in the industrial heritage!